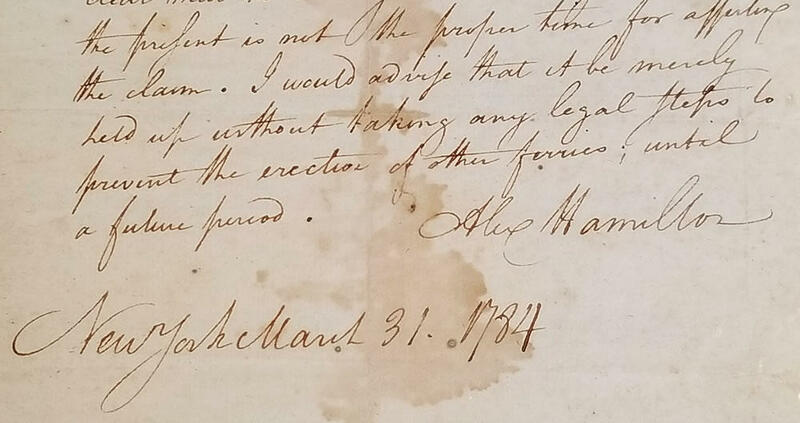 The image above, via Albany Law, is from the letter signed by Hamilton. + A letter, signed by Hamilton and dated March 31, 1784, advising a client on the right of ferriage. The letter was dated during the time that Hamilton and others were organizing the Bank of New York (now BNY Mellon). + A certificate of subscription to the trust for the benefit of Hamilton's family, issued in 1804, after his death at the hands of Vice President Aaron Burr. Certificates No. 61-62 were issued to John B. Church, husband of Angelica Schuyler and Hamilton's brother-in-law. + Trust certificate No. 226, also dated 1804, issued to Washington Morton, husband of Cornelia Schuyler and Hamilton's brother-in-law. + An early 19th century $5 bank note, Bank in the City of Albany. + An early 19th century $3 bank note, Saratoga County Bank. The small collection will be on display in the foyer of Albany Law's 1928 Building -- it's the older stone building that fronts the campus at the intersection of New Scotland Ave and Holland Ave.
As you no doubt know by now, Hamilton had many links to Albany. He married Elizabeth Schuyler at the Schuyler Mansion, and he studied and practiced law in Albany. (Aaron Burr also had a law office here.) At its commencement ceremony May 18, Albany Law will be conferring an honorary (posthumous) degree to Hamilton. The bar exam is one of the toughest tests anyone seeking a professional license must take. Imagine spending months studying for this one test, cramming different areas of complicated law and legal principles into your brain, hoping you only have to take the test once. And, congratulations, you did it! Now imagine going to apply for membership in the state bar association -- and you're denied the ability to practice law solely because of your gender. 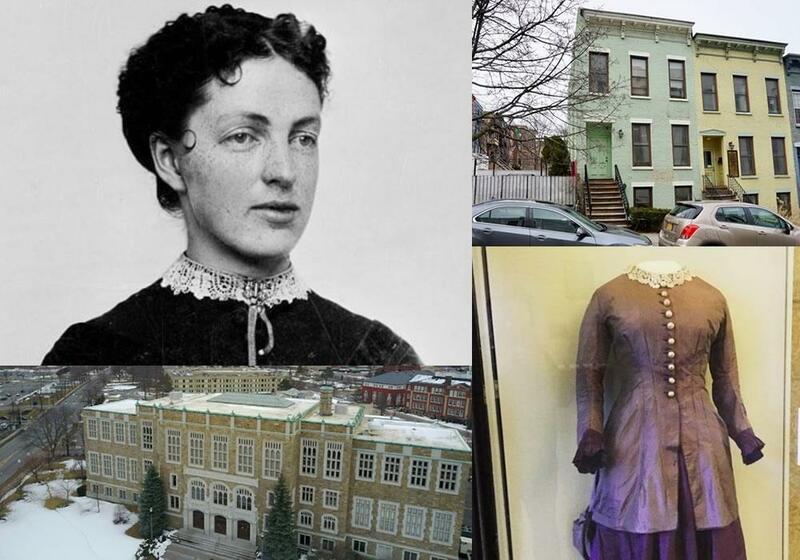 That exact scenario happened to Albany resident Katherine "Kate" Stoneman in 1886. And here's what she did about it. All events are from 6-7 pm (except where noted) and include networking afterward. See the first link for registration info. The series is presented by the LGBT Pro Bono Project of Albany Law School, Pride Center of the Capital Region, and In Our Own Voices. There will also be free legal consultations available -- by reservation -- with representatives of Tully Rinckey PLLC and Hoffman Warnick LLC. Registration for the event is required. Details are at that first link above. This might be a bit wonkish*, but it's a topic that a lot of people here are interested in: Albany Law is hosting an event next Tuesday, April 19 about regulating sharing-economy services such as Uber, Lyft, and AirBnB. As you might remember, taxi-app services such as Uber don't currently operate in New York State outside of NYC because of the way state law is currently structured. There's been a push to change that, though publicly at least, it appears the effort has recently been in the slow lane because of the budget. "Law and The Sharing Economy: How to Regulate Collaborative Consumption" is Tuesday, April 19 with events from 12:30 pm through 6 pm. It's free and open to the public. It's a presentation of the Albany Law Journal of Science and Technology and The Government Law Center. *Not necessarily a bad thing. At LGBT Law Day, Albany Law students and volunteer attorneys will provide attendees with free legal assistance on such issues as: name changes, adoptions, child custody, immigration, employment discrimination, gender marker changes, and upgrading dishonorable discharges under "Don't Ask, Don't Tell." This year's keynote speaker is state Assemblyman Daniel O'Donnell. The event is October 17 from 10 am to 3 pm at the Albany Law campus. It's free to attend, and "advance registration is appreciated." Albany Law is hosting an event -- Bridging the Gap: Police and Community Relations -- this Wednesday (September 16) to "to discuss police relations with minorities and young adults in the community." Questions for the panel can be submitted to bridgingthegappoliceforum@gmail.com. The discussion is in the Dean Alexander Moot Courtroom (80 New Scotland) at 5:30 pm. It's an open event -- no pre-registration required. Albany Law School has organized its first LGBT Law Day for this Saturday. The day is free and open to the public. The keynote speaker will be Cathryn Oakley from the Human Rights Campaign -- she works with state and local legislators on issues that affect the LGBT community and heads up the org's Municipal Equality Index. Also: "Albany Law students and volunteer attorneys will provide attendees with free legal assistance on such issues as name changes, adoptions, child custody, immigration, employment discrimination and civil rights." LGBT Law Day is this Saturday, March 21 from 10 am-3 pm. 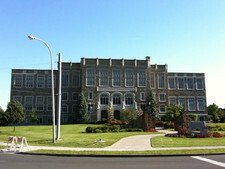 Albany Law says advance registration is appreciated. A sketch of James Campbell Matthews, New York State's first black law school grad and first black judge. Each Friday this February we'll be highlighting people and stories from the Capital Region in honor of Black History Month. 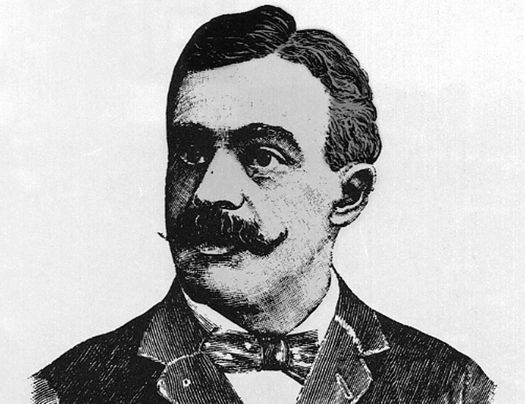 In 1871 the first African-American to graduate from a New York State law school obtained his degree from Albany Law. Six years after the end of the Civil War, James Campbell Matthews was admitted to the New York Bar and became one of just a handful of black lawyers in the country -- and one of the most successful. Matthews went on to become the first African-American judge in New York State. Oh, and in his first act as a lawyer, he may, or may not, have sued the city of Albany to desegregate its public schools. That part is tough to tell. Almost a century and a half later, in a time when we're complacently led to believe that all the world's history is available on a device we can carry in our pocket, the search for the Matthews story is a reminder that there are many important stories that still remain virtually untold. 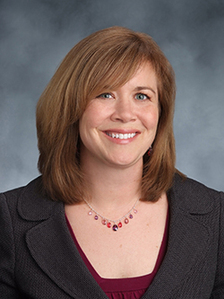 Albany Law School announced Thursday that Alicia Ouellette is its new dean and will become its next president in July. Ouellette has been the school's interim dean since last fall. Ouellette replaces Penny Andrews, who had headed up the school since 2012. Andrews announced last year that she'd be steeping down as president and dean at the end of the 2014-2015 school year. Ouellete -- who's name is pronounced "wull-ett" -- is an Albany Law School alum (class of 1994) and her academic focus has been the field of bioethics. Albany Law has advertised on AOA in the past. Presented by the Albany Government Law Review, Game of Drones will bring law professors, practicing attorneys and other experts together to discuss such topics as the use of drones for targeted killing, domestic drone use, and drone journalism. Nicholas Rostow, Distinguished Research Professor at the National Defense University, will deliver a keynote address on the use of drones within the context of the laws of war, as well as the President's constitutional authorities. The Albany Law event is from 1-5 pm on March 20 (a Thrusday), and includes two panel discussions and the keynote. (Speaker list at the link.) It's free and open to the public. Drones have gotten a lot of attention over the last few years because of how the US has used them in places such as Afghanistan. But the use of unmanned aerial vehicles in this country will also probably be a not-small topic of conversation eventually, as local police agencies, media orgs, and regular citizens make use of them. There was an interesting Verge article last year about how regulation of drones is lagging behind their current and potential uses. 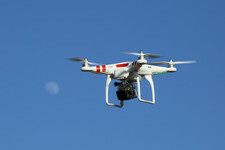 And last year there was a bill introduced in the New York State legislature that would have limited how drones could be used. When you think "drones," you might first think of surveillance and security state type stuff (and not without reason). But there are a lot of potential uses for the devices. We met a pro photographer last year who had mentioned he hoped to use them for commercial aerial photography -- it's just that the rules weren't clear about what was allowed. There seems to be growing public interest in where food comes from and how it gets to us, not just ends but also means. So this even could have some interesting threads for a range of people. 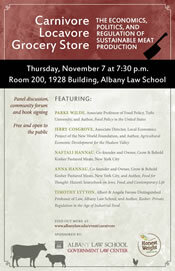 The discussion starts at 7 pm on November 7 at Albany Law. It's free and open to the public. Judges from the New York State Court of Appeals -- the state's highest court -- will be at Albany Law March 21 for an event titled "The New York Court of Appeals: The Untold Secrets of Eagle Street. "* The judges will "discuss the court's procedure and inner workings." The event is from 5-7 pm in Albany Law School's Dean Alexander Moot Courtroom. It's free and open to the public. 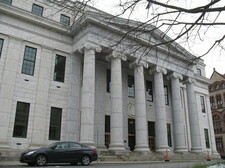 It's part of the Albany Law Review's annual Chief Judge Lawrence H. Cooke State Constitutional Commentary Symposium. *Because, you know, the court is on Eagle Street in Albany. It's across Pine Street from Albany City Hall. Albany Law advertises on AOA. Here, the alleged deceptive acts or practices are directed principally at college graduates deciding whether to pursue a legal education at ALS ... These individuals are called upon to decide whether to pursue a legal education and, if so, which law school to attend. While highly consequential in their own right, these decisions generally are intertwined with an individual's choice of career. Thus, in considering a reasonable consumer acting reasonably under the circumstances, the Court is mindful that it is dealing with a reasonably well-educated (though not necessarily sophisticated) group of consumers who are called upon to make major life decisions. As such, this case is unlike those involving representations made to the general public in connection with the sale of modestly priced consumer goods (cf. Guggenheimer v Ginzburg, 43 NY2d 268, 273  [sale of dictionary]). 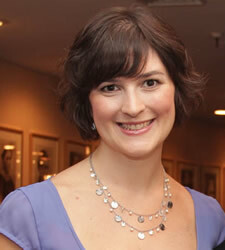 A symposium at Albany Law School October 11 -- "From the Page to the Pill: Women's Reproductive Rights and the Law" -- will include Sandra Fluke. The national spotlight found Fluke earlier this year after House Republicans didn't let her testify at a committee meeting on conscience clauses in health care. House Democrats then let her speak at a different committee meeting. Fluke spoke about the cost of contraceptives and the lack of coverage for them on the student plan at Georgetown, where she was a law student at the time (she's since graduated). Then Rush Limbaugh happened. Then the whole situation blew up. Fluke was one of the speakers at the Democratic National Convention earlier this month. The panelists will be divided into two panels. The first will focus on whether or not the law can and should mandate health insurance provider coverage of women's contraceptives, and the second will focus on legislation currently affecting women's reproductive rights. The event is from 1-5 pm at Albany Law. It's free and open to the public. Yep, Albany Law does advertise on AOA. Really, who needs another toaster? "We never wanted to prompt any of our guests for a gift of any kind, just coming to the wedding and sharing in the day was more than enough ... But for people who wanted to give us a gift, my husband and I were confident that our guests would happily redirect their generosity to a great cause." According to the clinic's web site, "The Health Law Clinic is designed to teach student interns to identify and address the legal issues which poor individuals living with chronic health conditions often face." You might know Martha and Frank by another name: Princess Mabel. 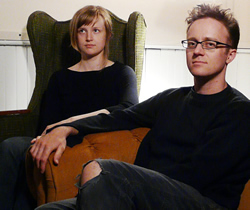 The two musicians have been a part of the local music scene for a long time. They moved to Brooklyn in 2008 after Martha graduated from Albany Law and got a job at a firm in Manhattan. According to the ALS article, the wedding gift donations were matched by the firm -- and the money has gone toward a fund to endow an annual award for a health law clinic student.